Carl Cook originally bought a small, rude dwelling, then put in huge amounts of sweat equity to make it into a livable cottage and a top-flight radio location. He rented it out to contesters, and by coincidence, Andy happened to have operated WPX CW there as P40Y in 2002, his first year of dx-peditioning. In the fall of that year, John Fore heard that Carl was looking to sell the place, and he called Andy to ask about it. The two of them, who only casually knew each other through NCCC activities, decided then and there to try to buy it. 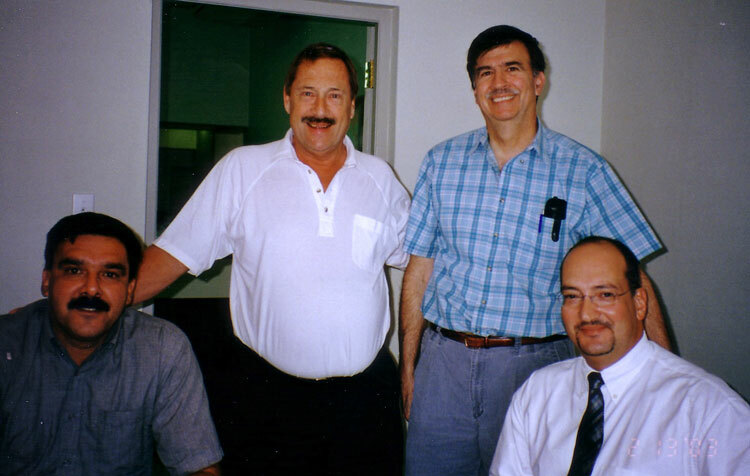 A turnkey deal was quickly worked out with Carl, and title was transferred to the house, radio equipment, car, tools, sheets, towels, silverware, etc., in February 2003. Here'a a picture of Carl and Andy at the Notary office. There are only a small number of notaries (lawyers) authorized to do property transfers. Actually, what was transferred was a ground lease, as the land itself, like that under most homes in Aruba, is owned by the Government. 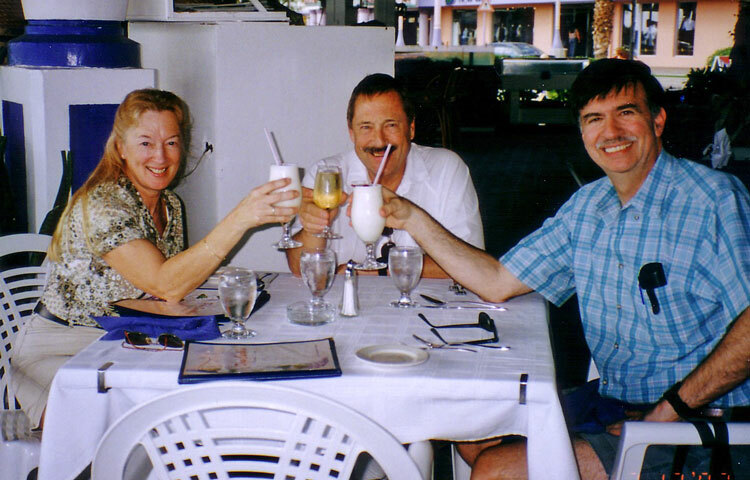 Here is the youthful-looking trio of Sue, Carl, and Andy celebrating the sale. John and Andy have greatly enjoyed the cottage. They've been very fortunate to have the house excellently managed by Chris and Jean-Pierre, who live nearby. 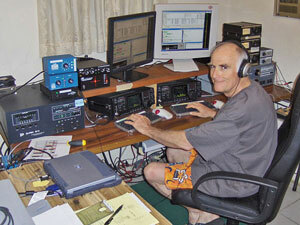 Ed, W0YK, has also devoted much time and effort to helping improve the radio facilities. In addition to all the interior improvements, there have been numerous antenna repairs, culminating in the week-long antenna party in February 2008 that resulted in a complete replacement of towers and antennas. As owners they find that there is always work to be done when they visit Aruba -- but that friends back home are generally completely unsympathetic to their whining of not being able to get to the beach due to maintenance responsibilities! 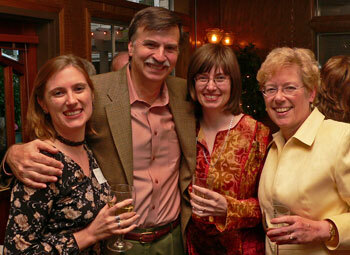 AE6Y, Andy Faber, says: I was first licensed as a novice and given the call WV2BWS on Long Island in 1958 at age 12. I remember how proud I was when the three-tube Heathkit DX-20, built with the help of my dad, worked on the first try (though the 120 volts across the key was a shocker!). After a few months, I took my general test, which in those days involved a personal visit to the FCC field office in lower Manhattan, sending and receiving code to the satisfaction of the FCC examiner and even hand drawing schematics of common circuits. During high school I enjoyed CW with a DX100B transmitter (all 17 tubes and 100 pounds of it) and an NC-300 receiver, eventually working DXCC before heading off to college. Inactive for a number of years, my interest was revived in an odd manner. While in law school at Stanford, I had occasion to travel east to interview with law firms in NYC. When my seatmate on the plane pulled out a copy of QST, it turned out he was W2TUK, the then-president of the ARRL. Several hours of conversation rekindled my interest and I was soon back on the air with a WB6 call. Then when incentive licensing was announced, I was indeed incentivized to obtain my extra class license and current callsign in 1978. In California, my main interests have been DXing and contesting. I currently have all DXCC entities confirmed; for years I just needed two, but got them both in 2009, thanks to the ARRL for finally accepting 7O1YGF in Yemen for credit, and also to the French for their Glorioso expedition. I have a two-radio station, with a single 65-foot high tower with Force-12 antennas. I became seriously interested in contesting when I decided in 1992 to write my own logging software. The DOS program CQP evolved into CQPWIN, which covers 11 contests plus generic logging. In each contest, I try to win the unofficial category of "highest score using homebrew software," and am normally victorious, except when competing against N6TR in Sprint or NAQP. I am an active member and past president of the Northern California Contest Club (NCCC), a group that I heartily recommend to anyone with any interest in contesting. From home, not having a "big gun" station, I mainly participate in domestic contests, including my favorite, the California QSO Party. I also enjoy getting SO2R practice (at least when condx are good enough that two bands are open simultaneously) in the NAQP and Sprint contests. Though I have often operated in the ARRL Sweepstakes, I'm not really a fan of that contest, especially since becoming a "rate junkie" at P4. My first ever contest from a DX location was in CQ WPX SSB in 2002 as ZF2AF from Bruce's station, ZF2NT, on Little Cayman Island. 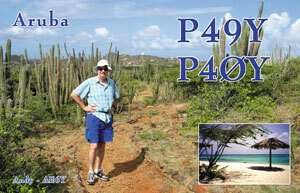 That same year I first visited P49V's cottage and did WPX CW as P40Y. Those experiences hooked me on the joys of contesting from the DX end. From our station, with two multi-op exceptions, I have always done single-operator contests, and have enjoyed testing myself in the more demanding 48-hour slugfests of ARRL DX and CQWW. I'm pretty much a self-taught contester, and try to learn from my mistakes, from time to time absorbing crumbs of wisdom from masters like Aruba neighbor W2GD. Picture taken in 2007 when hiking with daughter Holly in Arikok National Park. Home SO2R station. 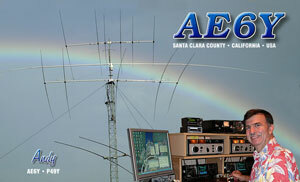 That's a natural rainbow behind the antennas. 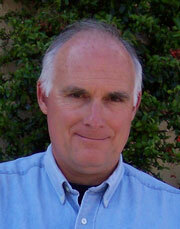 W6LD, John Fore, says: I was introduced to amateur radio by my grandfather, WB6HJG (SK), during the summer of 1968. My California-based grandparents were visiting our family on the East Coast (in Ridgewood, NJ), taking care of me and my three siblings for a month while our parents enjoyed an extended European trip. With my grandfather’s guidance and encouragement, I spent that month working on mastering the code and theory. By the end of the summer, at the age of 11, I had taken the novice test and was issued my first call sign, WN2HID. My parents provided lots of early support too, in part, because one early goal was to use ham radio for regular communications between my grandparents on the West Coast and our family on the East Coast. They bought my first rig, a Heathkit HW-16, which I assembled during the fall of 1968. Meanwhile, my dad arranged to get an old TH-4 tri-band beam from a work colleague that he mounted on the chimney of our three-story house. By late fall, I was on the air with an excellent set-up for a novice -- the HW-16, the tri-band beam and wires on 40 and 80 -- making regular contact with my grandfather in California. Our system was that whoever wanted to initiate a call would call the other side on the “landline,” let it ring once, and then hang-up. Then the other side, if home, would respond in kind, and we would make contact on a pre-arranged 15 meter frequency. For the rest of my childhood, no one was permitted to answer the phone on the first ring in our household. The next four years were a period during which I was very active in ham radio and I advanced from the Novice to Advanced class license by the time I was 15. DXing was a favorite activity as well as early forays into contesting in the form of the Novice Round-Up (in which I placed somewhere in top ten in 1969) and Field Day with the local radio clubs. When I was 16, my ham radio based experience with electronics enabled me to get a great job at a local electronics store that I kept throughout high school and, periodically returned to throughout college and even law school. Like many, though, by my senior high school years, the combination of school, work and other interests, had taken over and this phase of my ham radio activity ended. My interest in amateur radio was rekindled one day over 15 years later when, during a futile attempt to find a short-cut through Stanford’s campus to the adjacent Stanford shopping center, I stumbled across the school’s club station located on what was then an isolated area on the outskirts of campus. At the time (1989), I had been living on campus at Stanford with my wife, a grad student, as a Resident Fellow for three years and throughout that period had been unable to locate any evidence of a university radio club as this just happened to be a period of relatively low club activity. From the outside, the station looked pretty impressive to a guy who had never experienced (or seen) anything bigger than a four element tri-band beam and dipoles on the low bands. The station then had five element yagis on 10 through 20, four elements on 40, a KT-34XA, and more. All the gear was located in a couple of portable military surplus shelters and connected to towers and telephone poles with 1” hard line. I started making regular visits to the site in an effort to make contact with the club (someone had to use all that equipment!). Finally, one Saturday afternoon, after what seemed like several months, I happened upon a Japanese post-grad student who was using the station to make contact with his mother back home. He was able to explain the mystery of the unpublished times and locations of club meetings. Once contact was made it was easy to join the club and get station access. After being completely inactive for over 15 years, it was a thrilling experience to parachute back into a well equipped, modern station -- main transceiver (Icom IC-761), high power (Alpha 78) and big antennas on decent towers – and to experience colossal pile-ups for the first time (at least they seemed colossal then to a relative newbie), especially from Asia. This was something I had never experienced on the East Coast. Soon I was experimenting with contesting from the Stanford club station, both on my own and with other club members. In 1997, the station was moved to its current site in the Stanford Foothills and several of us spent the late 90’s rebuilding and expanding its capabilities as well as ramping up the level of the contesting activity (which had fallen off from high levels of activity in the late 70's and early 80's). In the fall of 1999, I finally got around to attending a meeting of the Northern California Contest Club which put me in contact with a great group of talented and experienced fellow contesters, and I quickly expanded my horizons with respect to the world of contesting. 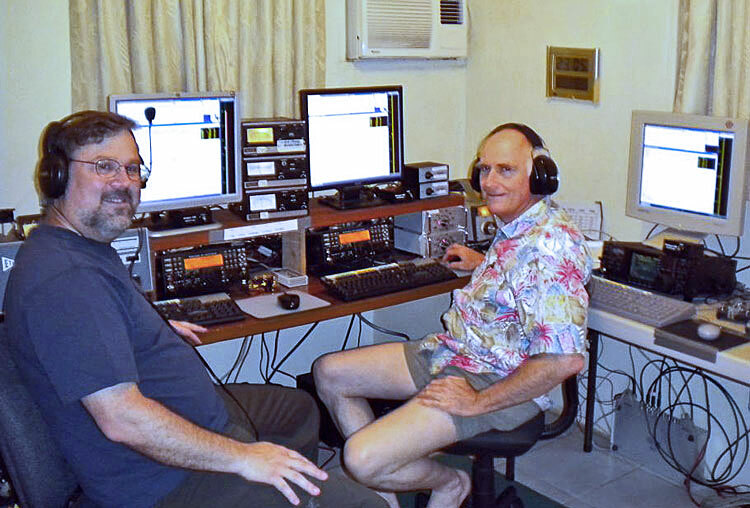 At the time, Carl, AI6V, put his Aruba station up for sale in early 1983, I had long wanted to try my hand at operating and contesting from outside the U.S. but had never had the opportunity. I was confident it was something I wanted to jump into. After talking with Andy, AE6Y, who I knew from the NCCC and who had rented the station previously, it was an easy decision to go forward site unseen. I enjoy both, single-op and multi-op contesting, with my favorite class generally being either multi-single or multi-two, as I enjoy the challenge of working with a small team to optimize results. I reside in Atherton, California (about 25 miles south of San Francisco) with my wife, Antonia, and four kids (ages 10 to 22). The home station is a K3/FT1000D/FT1000MkV, with AL80B amp and very modest antennas (due to code restrictions): a BigIR vertical (a recent addition) and wires (only a 20 meter dipole at the moment). Thus, almost all of my domestic operating is from the Stanford club station using the call sign W6YX. Professionally, I have been a partner with the Silicon Valley-based law firm of Wilson Sonsini Goodrich & Rosati for almost 20 years. I work mostly with technology and other growth companies, including start-ups, as well as investment banks and investors in the areas of finance, mergers and acquisitions, joint ventures and other business transactions. The past 20 years in Silicon Valley specifically and technology industries more generally have been years of explosive growth (and, at times, great volatility). I have had the privilege of working with many of the leading growth company success stories and technology innovators of the past two decades. It has been an exciting ride. It has meant, however, that work demands have often conflicted with radio contesting activities, especially from Aruba which generally requires a one week commitment made well in advance. I hope to be able to manage a better balance in the coming years! W0YK, Ed Muns (not an owner but a frequent user and station developer and maintainer, par excellence), says: As a teenager I was interested in electronics. My Scoutmaster was a ham (K6HVV) and my earning the Radio merit badge got me interested in ham radio. I passed my Novice license exam at age 15 and receive call sign WN6AYK, which encouraged my Dad to get his license, too. That turned out to be a killer strategy for me, because he bought a nice Drake 2A receiver and I found a DX-40 transmitter that we could afford. Initially, this was set up in the garage and I was thrilled when I first worked another Novice outside the state of California. Within a few months, we both got our Technician licenses and I went on to get my General. Another Elmer, WA6WJG, was an avid early morning 40 meter CW operator who used ham radio to evangelically promote Christianity throughout Japan and the Far East. I talked my dad into letting me install a 40' pushup TV mast on the back of the house for a 40 meter inverted-V. I spent a couple hours every morning before school working 40 meter CW DX. College and my early career as an electronics engineer for Hewlett-Packard Company caused a hiatus in my hamming. After moving to Colorado in the early 1970s, I was intrigued by a friend's mobile CB installation. That seemed like a useful feature to have on long family driving vacations around the country. Impulsively, I ran out and bought a CB radio and antenna, but only when I started the installation did I recall that I had all my ham gear stored away in the garage, including a 2 meter transceiver. The CB equipment was returned to the dealer and out came the HBR-16 receiver I made in high school from the QST series by Ted Crosby, W6TC, a retired RCA Engineer living just south of us in Sun City, CA. I copied the daily ARRL code practice sessions and two weeks later took the day off work to travel down to the FCC office in Denver and passed the Novice exam with about 50 others. Then I passed Technician with a handful of people. A couple of us then took the General exam. It was then lunch time, but I came back and took the Advanced and Extra exams by myself. At 2pm, I left with call sign WB0WNU. A year later, the FCC initiated incentive licensing and I selected the call W0YK which I've held since. After moving back to California I chose to keep the familiar (to me and others) call sign which by then was all OK with the FCC. The 2 meter mobile installation never really held much interest for me, but getting re-licensed sparked my DX interest and I quickly realized that contests were very productive for working new band/mode-countries. That led to several experiences at the K0RF multi-multi and I was hooked on contesting for life. DXing took a back seat and I entered a lot of contests each year, expanding into the domestic ones as well. I installed a 120' tower in Colorado with a 7-element 10, 4-element 15 and 5-element 20 rotating on top. I had stacked (at right angles) pair of 40 meter wire quads whose reflector was switch able so I had four directions covered instantly. 80 and 160 were inverted-Vs and I installed a KT34XA on a separate 40' tower. Returning to California with HP in 1988, I engaged a real estate agent to find a ridge top location where I could set up my ham station. We looked at properties for six months before I ultimately purchased a 77-acre parcel of undeveloped land and had a house built over the next 2-1/2 years. The first tower with screw-in anchors and way too many Yagis stacked on it, blew down in one of the huge, but normal, rainstorms with high winds that we get on this ridge top facing the Pacific Ocean. The downed tower was actually just leaning in the large conifers to the north of it. Dave and Barb Leeson, W6NL and K6BL, came over with their winch-equipped Jeep and we built a second tower next to the first and used it as a gin pole to pull up the first tower for disassembly. For 20 years now, I've had an 80' tower with various antennas covering 160-10. Currently there are home-brew OWA-type Yagis for 10 (3 and 5 elements), 15 (5 elements) and 20 (5 elements). There are custom designed Force 12 antennas for 40 (2 elements) and 80 (dipole) plus inverted-Vs for 160 and 30. 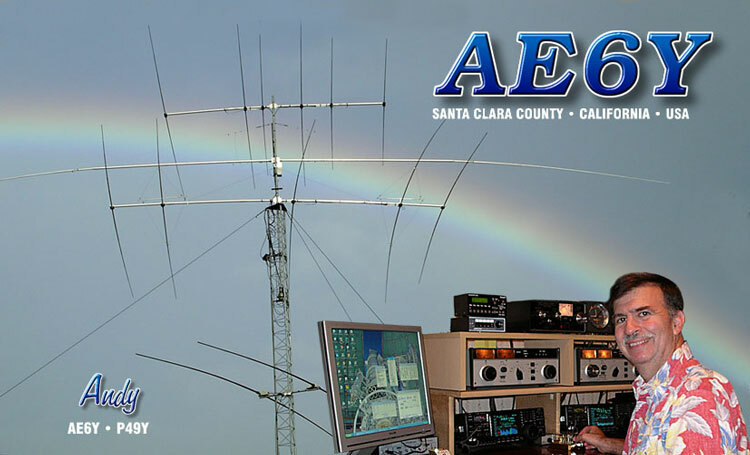 In 2004, the ARRL initiated the club competition gavel for their RTTY Round-Up contest and our local contest club, the Northern California Contest Club (NCCC), challenged its members to get on RTTY. I did so very reluctantly, and complaining all the way, until I actually did the contest and enjoyed it. I even won the Pacific Division SOHP plaque that year and the NCCC won the club competition, so I was now hooked on another contesting mode. In 1998, I was looking for a way to landscape around the house and had a small backyard vineyard company refurbish the abandoned vineyard on my CA property. It was completely overgrown with brush 10' high and was a large job to get 2.5 acres of Pinot Noir vineyard planted. The next year I took over maintenance of the vineyard myself and began expanding it 1/2 acre per year while I continued as an executive at HP. In 2001, I left HP and by 2005 had completed installation of a total 12 acres of Pinot Noir and 1 acre of Syrah. Winegrowing has been my second career since then and I've completed all the Extension viticulture coursework at UC Davis as well as earned my certificate in winemaking there. My partner, Mary Lindsay, handles marketing and sales while I continue as a seven-day/week farmer, tending to a lovely ridge top vineyard at 2600' overlooking Monterey Bay. We've avoided installation of a winery facility, instead having our wine custom produced by winemaker Tony Craig of David Bruce fame. About 10% of our grape production goes into our own label, Muns Vineyard, and the rest goes into other local brands such as Sonnet, Silver Mountain, Soquel, Savannah-Chanelle and Vinehill. Ed demonstrating his "SO2RHKM" style of RTTY operation (two radios, two hands, two keyboards, two monitors). Ed and John getting ready for their 2010 M/S operation in ARRL CW.